Info: A 28-year old Kirti monk called Lobsang Thogme set fire to himself and died on Saturday, March 16, the fifth anniversary of a protest in Ngaba (Chinese: Aba), eastern Tibet, in which armed police fired into an unarmed crowd. He is the third Kirti monk to set fire to himself on the anniversary of the crackdown in 2008. In a translation from the Tibetan, the Kirti monks in exile said: "Before reaching the gate, he fell to the ground. By that time, many monks and laypeople reached the spot, and he was taken to the county hospital, but passed away soon after. It is not known what he shouted during his protest. On arrival at the hospital, a large force of police and soldiers came there and forcibly took possession of his remains, which they then took to the prefecture headquarters at Barkham(Chinese: Markam)." r Lobsang Thokmey, 28 yrs old, a monk from Kirti Monastery. He self-immolated in Ngaba, Tibet on March 16th 2013. The army took his body away from the local hospital. March 16 is a painful memorial day for Ngaba people. In 2008 there was a massive crackdown against the local protest for freedom. many lost their lives. In 2011 Phuntsok Jarutsang and in 2012 Lobsang Tsultrim, both from Kirti monastery, self-immolated. When will peace come to Ngaba? Tibetan pilgrims outside Kirti monastery in Ngaba county, March 11, 2012. Tibetan monk from the restive Kirti monastery in Sichuan province burned himself to death on Saturday in protest against Chinese rule and to mark the fifth anniversary of a bloody Chinese crackdown on Tibetans in the area, sources said. Lobsang Thokmey, 28, torched himself at the monastery in Ngaba (in Chinese, Aba) county, which has been the epicenter of the Tibetan self-immolation protests against Chinese rule raging since February 2009. His protest raises to 108 the number of Tibetans who have burned themselves while challenging Beijing’s rule in Tibetan regions and calling for the return from exile of Tibetan spiritual leader the Dalai Lama. Lobsang Thokmey emerged burning from his room at the monastery carrying a Tibetan Buddhist prayer flag, according to monks at the Kirti exile monastery in India's Dharamsala hill town, citing local contacts. He ran a distance until he collapsed just before the entrance of the monastery, according to monks Kanyak Tsering and Lobsang Yeshi. Fellow monks rushed Lobsang Thokmey to the county hospital but he died on arrival. "Before he could reach the main entrance of the monastery, he collapsed and fell to the ground," exiled monks Kanyak Tsering and Lobsang Yeshi said in a statement to RFA Tibetan Service. They said that Lobsang Thokmey's body has been taken away by Chinese police. He self-immolated in "protest against the wrong Chinese policy in Tibet," they said. On Feb. 27, 2009, a Kirti monk in his mid-20's set the stage for the fiery protests when he self-immolated after the authorities cancelled prayer ceremonies at his monastery. He was shot dead by security forces as he was burning, reports have said. Two years later, Chinese security forces launched a major clampdown on Kirti monastery and took away hundreds of monks, fueling the self-immolations. 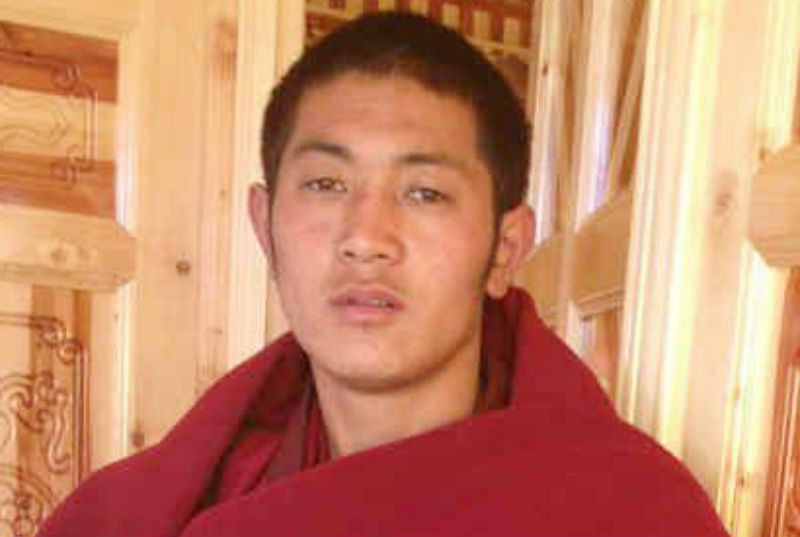 On March 16, 2011, Phuntsog, a 20-year old Kirti monk, burned himself to death to mark the third anniversary of the Ngaba crackdown and exactly a year later, Lobsang Tsultrim, a 20-year-old Tibetan monk also from the Kirti monastery, set himself on fire and shouted slogans of protest against the Chinese government along the Ngaba main road but was taken away by police and died later. BREAKING : New self-immolation, today March 16, 2013 in Ngaba. Today around 2:40pm (local time), a monk from Kirti monastery identified as Lobsang Thokmey, 28, has self-immolated to protest against Chinese repressive rule inside Tibet. He set himself on fire nearby Kirti monastery's western gate and deceased following the self immolation in Ngaba County People’s Hospital. Lobsang Thokmey was born in Rangtrig Tsang, Upper nomadic area of Tingon (Chi: Cheng Guan) township in Ngaba County, Ngaba Tibetan and Qing Autonomous Prefecture in Sichuan Province. The source in the region said “ Lobsang Thokmey has poured gas over himself in front of the gate of his residence in the Kirti monastery and set fire while marching toward the western gate of the Kirti monastery. He fell on the ground after few minutes, and some eyewitness noticed the religious flag in his hands but could not confirmed whether he shouted slogans or not”. After monks and local people noticed Lobsang Thokmey’s self-immolation, they took his body to the local Hospital. Unfortunately, the medical could not rescue his life and he deceased later on. The Chinese authority has deployed huge military forces within the Hospital and transfered Lobsang Thokmey’s body to Barkham County forcibily. Lobsang Thokmey's father is Rangtrig and mother Tepu. Lobsang Thokmey joined Kirti monastery since his childhood and presently he was studying Buddhism in 8th grade of Tibetan traditional education system within the monastery. He was also one of very good and positive model for the younger generation within the Monastery in terms of attitude and education as well. Lobsang Takmeyn leaves behind him his parents, three brothers and one sister. Today is one of very sensitive day for people in Ngaba and region, because it was the 5th anniversary of the massive killing and bloody crackdown in Ngaba since 2008 by the Chinese heavier armed military forces. So far, people in Ngaba have been preserving this unforgettable and traditic moment every year through different strategies, particularly, Lobsang Phuntsog, the second historical self immolation on 16th March 2011 has occurred today in back 2 years, and then Lobsang Tsultrim has self immolated to protest against Chinese rule in Tibet on 16th March 2012 in back one year, and then today, again, a Kirti monk identified as Lobsang Thokmey has self immolated to protest against the Chinese rule in Tibet today on 16th March 2013 to preserve the 5th bloody crackdown anniversary of Tibetan peaceful protest in Ngaba in 2008 by Chinese heavier military forces. The information provided by Kanyag Tsering and Lobsang Yeshi in Kirti monastery, Dharamsala, India on 16th March 2013.